Coventry welcomed me with a familiar aroma of frozen air. Quite startling, presenting the illusion as if I’ve just left this town only a few months ago. Many things were seemingly frozen by the time: the buildings with the same labels, the same texts, the same smells, and the same tones. Even the the sun that has not been set at 20:00 was so Coventry :). But actually many things have changed too. The lower precinct had been renovated, and now become a neat mall, which is linked to the upper precinct that is not changed. I read somewhere that this is the first pedestrian precinct in England of this kind. It was then copied in many other cities. The new millennium arc has also been completed, adding an attractive area around Pool Meadow and the Museum of Transportation. 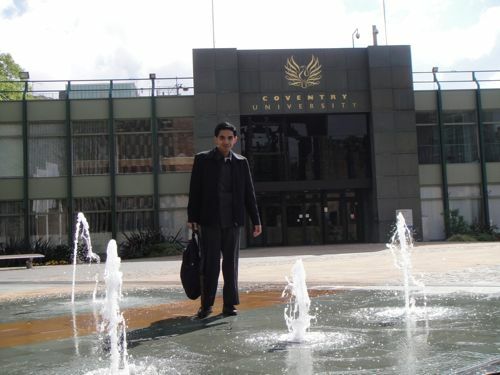 We started exploring my Coventry from none other than Coventry University. We stayed for two nights in Ibis Hotel, which is just behind the Technocentre of the University. 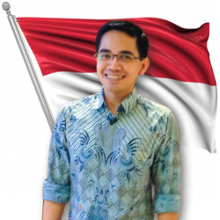 This campus shares a phoenix as its mascot as the city, as the symbol of reawakening after a catastrophe. The phoenix always re-creates itself from its ashes, and presents a new shining life to fulfill its purpose to safeguard the world. The university itself becomes another symbol of the city, that reawakens and reshapes itself by the capabilities and pioneering in technology. 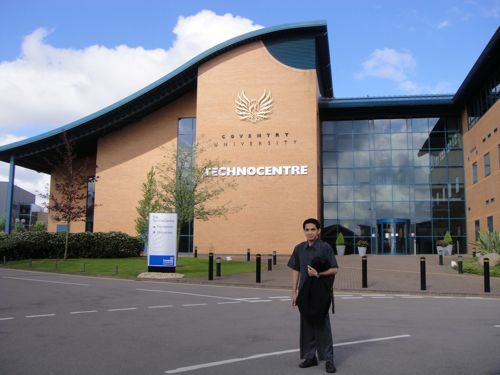 We started exploring the technocentre, the Lanchester library, the Jaguar building (where I got my lectures nine years ago), and also the headquarter. The new logo (i.e. the old logo that is mirrored) now adorns almost every buildings on campus. 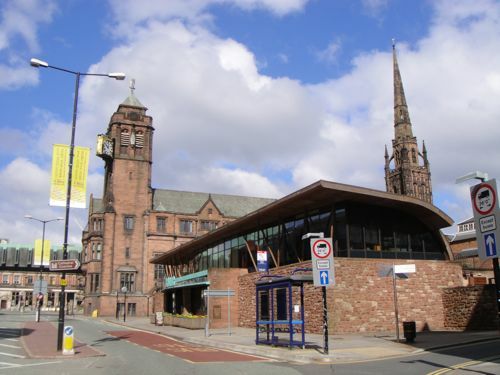 Herbert Museum, the cultural and historical centre of Coventry, was the next target. 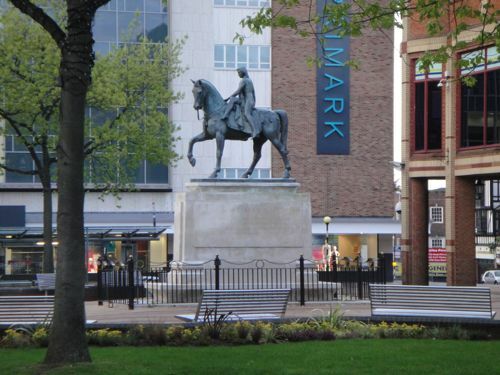 Coincidentally there was an exhibition about the origins of Coventry here; from its prehistoric times, the formation of the city, the story of Lady Godiva, the civil war, the industrial revolution, and the reborn of Coventry after being were destroyed by the world war. We spent the time also to visit Waterstone’s bookshop, to walk around the city centre and the famous precincts, and other areas around the city. Seeing the sight of the city, one would understand another pun of Coventry. 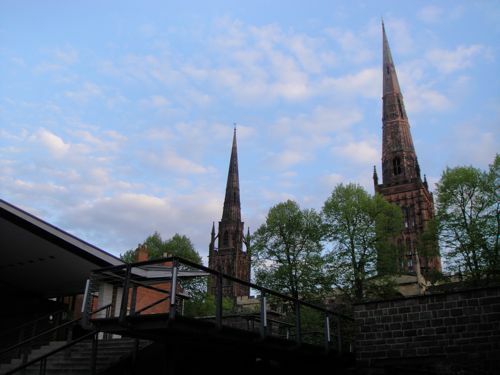 “Coventry inspires” as I blogged earlier, does not refer only to the phoenix and the high spirit of the city :), but also to the fact that this city has three spires as its landmarks. Yes, Coventry in spires :). 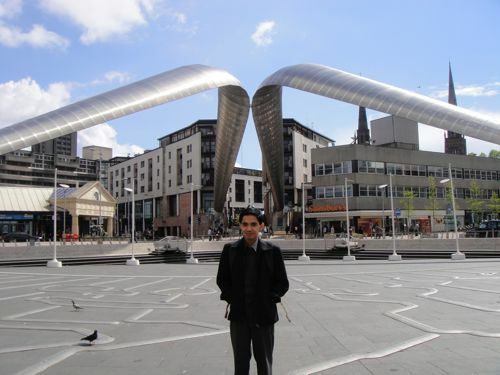 We spent the second days in some cities around the old county of Coventry and Warwickshire. Stratford-upon-Avon with dozens of large white swans on the river Avon. Hey, you know that in Welsh (Cymraeg), the word Avon or Afon itself means river :). We also took a sight to the magnificent Warwick Castle. 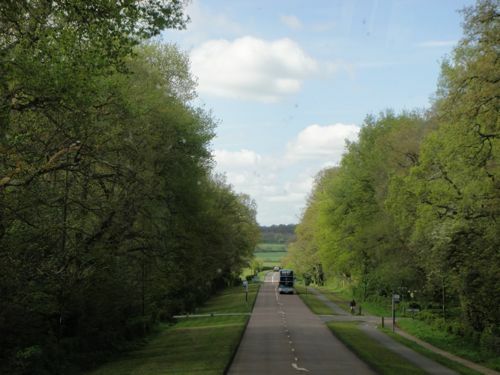 The last city we visited in the old county was Leamington, where we had a rest in a green park. Also we spent the time to played with the cute squirrels. But I had to leave my city. Again. I had to visit another city that marked my history: Thirsk :). Hi. I am Lisa Livingers. Glad to make your acquaintance.